About 15 years ago, when I was re-examining my inherited faith following my mother’s death, a friend pressed me to define my new set of beliefs. I was pretty sure I was no longer a Christian, I told him, but I couldn’t put a name to who I was. There was no “ism” or “ite” that explained the new me to my satisfaction, so I was left instead with a list of things that I loved. This was back in the days of physical letters, so my friend still has that list. But I can remember some of the things on it: John Coltrane solos, writing in a spiral-bound notebook, playing guitar on a sunny morning. Cats. Bicycles. Building wood fires in a cast-iron stove. And the green of the left-field wall at Fenway Park. As I drove down to Boston with another friend, 15 years later, we agreed that it didn’t matter much to us who won the game that night. The Sox hadn’t been playing well, and so it would be nice to see a victory, but we couldn’t count on that. 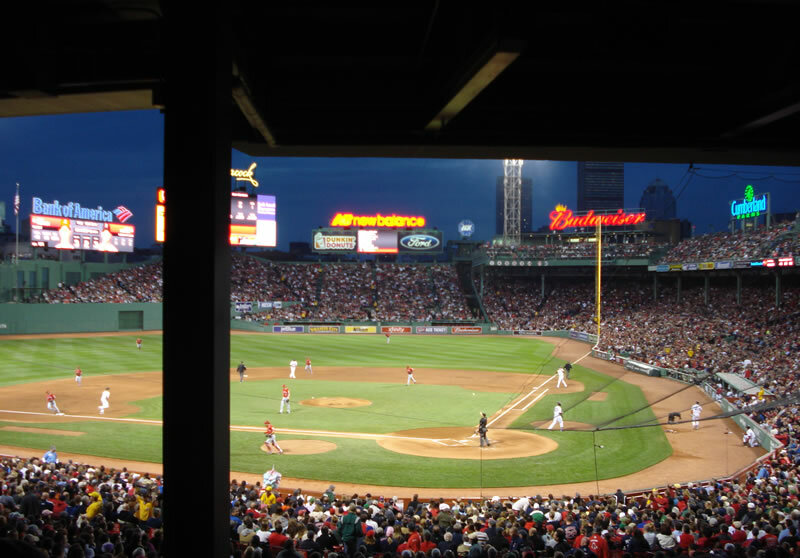 What we *could* count on was the experience of being at Fenway, that incomparable atmosphere that reliably puts me into a Zen-like state of grace that others must pay professionals $85 for a 50-minute session to achieve. Although I’ve seen almost two dozen ballgames over the past year, I realize that with a few exceptions, I haven’t written much about the games themselves. Maybe this is because most of the games I’ve attended haven’t been close-fought contests. Or maybe it’s because, for me, the feeling of being at a ballpark – and the thoughts that feeling engenders – is the real payoff. I’m *always* happy at Fenway, even when the Red Sox aren’t winning. And I’m happy to go to the games with a friend who doesn’t press me for isms or definitions, who understands – and shares – my need to wander around the ballpark, solo, in the early innings, so I can get a feel for the place again, so I can soak in the vibe. Green metal railings, faded red logos painted on a brick wall, iron posts and trusses like a 19th-century railroad station. The ever-present hum and burble of the crowd which emits boos and cheers and swallows them up again. The smell of sausages and spilled beer and the men’s room and of peanut shells ground into the rough concrete floor. The TV sets showing the game overhead with a two-second delay as you’re waiting for your food; the hiss and flash of the Mass Pike beyond the parking garages; the Prudential Center in the sunset, backed by the glimmering Boston Harbor. Our seats were in the blue section, between home and third, a good place to watch a game if you don’t mind looking around one of those iron posts to track a fly ball to centerfield. Our neighbors – another X factor beyond our control – watched with respectful attention, and didn’t make us get up and down too often for bathroom breaks. And this time, we got a good contest. Both pitchers struggled with their command early, walking several batters, but neither club was able to break through. The Sox were down by one in the bottom of the fifth when Dustin Pedroia, the Sox’ second baseman, came to bat. My daughter, who, at nine years old, can be excused for wanting definition, insists on me having a favorite Red Sox player. Pedroia is 5 foot 8, at most. He plays second base, the position always assigned to little guys, and therefore the position I played growing up. He hits home runs and bumps forearms with the team’s sluggers as he returns to the dugout, not noticing – and not caring – that he’s nearly a foot shorter and 100 pounds lighter than those sluggers. And so I was sitting there in the wooden blue seats wearing my Pedroia shirt, cheering him on as he worked the count full against Jered Weaver, the Angels’ ace. Two out, runners on first and second. He fouled off one tough pitch. Then another. And another. And another. With each pitch, the crowd dialed its noise up a notch. Pedroia stood stock-still in the batter’s box, the picture of concentration and confidence, bat held high above his shoulder, at the ready. More fouls. I started laughing. The people around us started laughing. We cheered and hooted and I wondered if any other sport has these types of moments that could conceivably go on forever. I thought of the book by W.P. Kinsella, The Iowa Baseball Confederacy, which centers on a never-ending game that has the home team tying the score each time in their half of the inning, extra innings into infinity. In that book, a Native American character maintains that baseball was the only thing that the white man got right. The crowd roared in anticipation. Weaver threw once again, his twelfth pitch. Pedroia uncoiled and ripped a single up the middle, plating two runs, putting the Red Sox ahead. And Fenway exploded. We high-fived the people around us, shouted, danced, and laughed and laughed and laughed. There was more excitement to come, several innings later. A wall-ball double by new acquisition Adrian Gonzales, clearing the bases. A double to left by Youk. A home run into the Monster seats by Big Papi, David Ortiz. And, subtler: Pedroia reading a hard grounder off the bat, quickly backpedaling into the outfield grass to get the best bounce, snagging the grounder and throwing out the runner at first to end an inning. We stayed until the end. The Sox won, 9-5. I got home at around 2:15, slept for four hours, and went to work, bouyed by the memory of Pedroia fouling off pitch after pitch before coming through, bouyed by the memory of us laughing and laughing in the blue seats. One could say such moments are not much to build a life upon. It’s not really a belief system, not a theology. The false idols of ballplayers are notoriously fallible; the last Sox player I liked as much as Pedroia was Nomar Garciaparra, who turned surly and injury-prone before being traded to the Cubs. 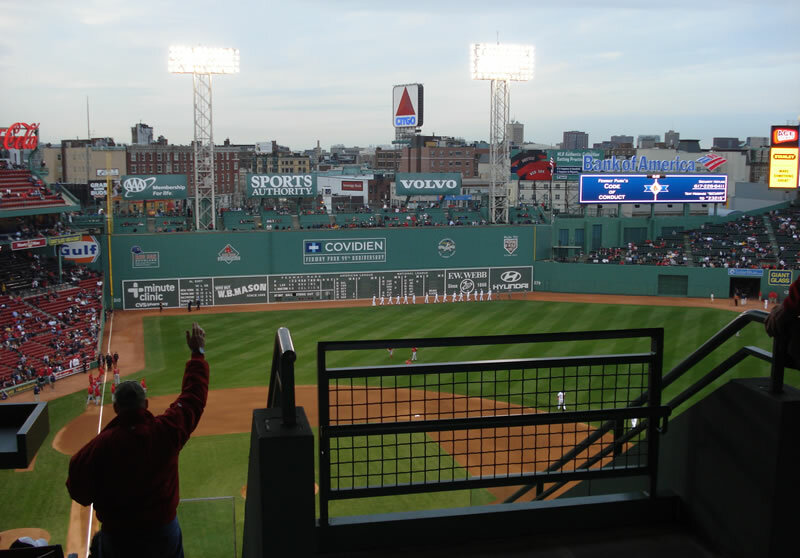 At one time in the late-90’s, the Red Sox ownership talked about razing Fenway and replacing it with something newer, something shinier. Cats die, guitars wait unused in their cases, a person gets tired of building fires in the wood stove every morning. But the only way I can describe the feeling in Fenway after Pedroia sent that liner up the middle is this: love. At that *is* something to build a life upon. Brilliant. Even a Jays fan (and I hope a fan of every other team – Yanks included) can appreciate the mystique of Fenway and all that makes it up. Great post as usual.